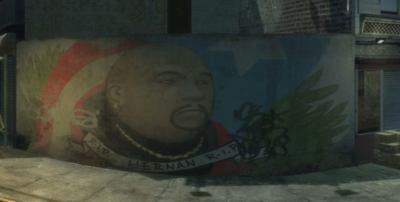 Mural of Hernan saying "R.I.P Hernan R.I.P"
Hernan is a character in the HD Universe mentioned in Grand Theft Auto IV. Hernan is, in 2008, a deceased man whose image appears on a mural in Bohan, where Rocket Street, San Quentin Avenue and Joliet Street meet, just across the street of Niko Bellic's safehouse and next to Non Wines & Liquors. Hernan is possibly a reference to the rapper Big Pun who died in 2000. This page was last modified on 9 February 2014, at 02:19.